Planting wheat in the fall with the expectation of both grazing cattle and harvesting the grain during the next year is a common practice in the Southern Plains. Decisions that are made now and into the fall will impact the success of this so-called dual-purpose wheat system, according to Romulo Lollato and Stu Duncan, extension crops specialists at Kansas State University. If soil moisture is adequate, early planting is preferred for dual-purpose wheat. In Kansas, this means a September seeding, two weeks prior to when wheat is normally sown for grain only. In a recent Kansas State Extension eUpdate newsletter, the authors cite results from a field trial done in Oklahoma showing that fall forage production declines by 1,000 pounds per acre for each two-week delay in planting during September. Dual-purpose wheat also requires a seeding rate of one and one-half to two times greater than grain-only wheat management. Kansas State research has demonstrated that the additional fall forage yield realized by boosting seeding rates from 90 to 120 pounds per acre can more than pay for the higher seed costs if about 30 inches of annual precipitation are received. The benefits of higher seeding rates are best realized if planting is done in early to mid-September. Planting wheat earlier in the fall also means that soil temperatures are more likely to be warmer/hotter. According to Lollato and Duncan, higher soil temperatures can shorten the coleoptile length of germinating wheat. For this reason, they warn against planting dual-purpose wheat seed too deep. “If moisture is not available in the top 1 to 1.5 inches of soil, it is preferable to seed shallower and wait for rain rather than planting deeper to moisture,” the authors explain. • High germination when soil temperatures are above 85°F. • Tolerant to low soil pH. • Excellent forage production and fall grazing potential. • Good regrowth potential after grazing. • Genetic resistance to barley yellow dwarf, wheat streak mosaic, and Hessian fly. • Late first hollow stem date in the spring. • Good spring tillering and grain yield potential. The extension specialists also emphasize the importance of soil fertility in a dual-purpose wheat system. Because the wheat is being grazed, more nitrogen is removed and approximately 60 to 90 pounds of additional nitrogen per acre is needed for wheat that is being grazed. This can be applied before planting or during spring to ensure proper grain formation. Soil phosphorus levels also need to be monitored. Phosphorus is needed for adequate early growth and tillering. Banding phosphorus at planting is more effective than broadcasting, especially on acidic soils. Acidic soils will impact forage production more than grain yield. The authors recommend a minimum soil pH of about 6 to maximize fall forage production for most varieties. Banded phosphorus helps to mitigate some of the negative effects of low soil pH. “Don’t begin grazing wheat in the fall until the secondary root system has developed enough to sufficiently anchor the plant,” the extension specialists warn. This generally occurs when the wheat has 6 to 8 inches of top growth. 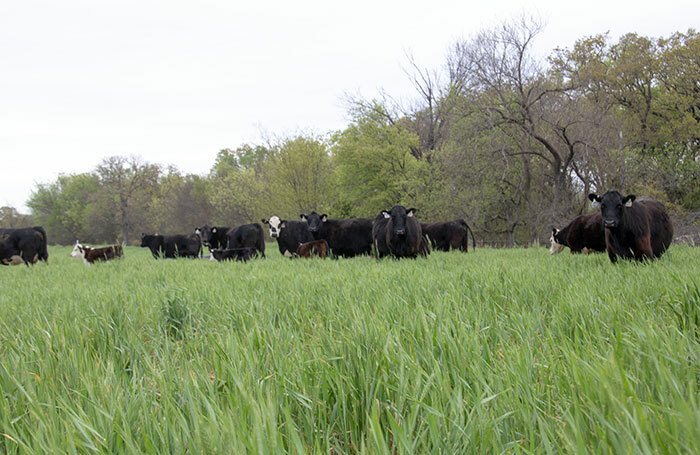 If grazed too early, cattle will pull the entire plant and its root system out of the ground. Set fall stocking rates at 250 to 500 pounds of animal per acre, depending on weather conditions. Spring stocking rates are one and one-half to two times greater. Most importantly in the spring, cattle need to be removed before the first hollow stem develops. Though it will be a long time before spring grazing commences, dual-purpose wheat decisions made now and into the fall will have a large influence on next year’s animal and grain production.